2004's The Weak's End was a great album for serving the purpose that it served. That was probably the most redundant statement of the century. What I mean is it did everything a great band needs their debut to do: introduced their sound and potential, put them on the scene map, solidified a fan base, and sold rather well. Likewise, last month's release of The Question did everything a great band needs a follow-up release to do: outdo its debut and impress audiences with stronger musicality and song structuring. Emery's two major label album career (if you consider Tooth & Nail a major label) is already full of fulfillment and development, and it is deservingly so. They are perhaps the strongest band in the ballpark of passionate, broad-sounding emotional rock. 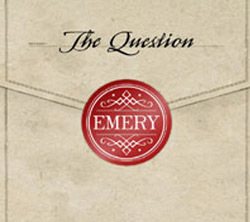 No one can really capture that same melancholy and anxious mood that Emery so successfully capitalizes on. Here's how The Question eclipses The Weak's End: it presents a more developed sense of vocal melodies and vocal harmonies, smarter lyrics, and retains the same energy throughout the record. In The Question, you get a lot more layering: two melodies at a time, a great mold of half-screamo half-emo, subtle yet appreciated guitar and synthesizer lines, and smooth, effective transitions between broader heavier chugging and flowery pop sensibilities. This album also has very unique album art: 19th century Industrial Revolution theme. First thing on my mind was, "whaaat?" And that's still on my mind, but I think it is pretty cool and even fits into some of the music. I don't know, I don't think this has more to do with the review so that discussion ends here. This album is alive, and is kept so by the intense rhythms and encompassing guitar lines, both of which have improved immensely from their debut. It's almost baffling how much this band has matured between the two albums, a duration of one and a half years. Besides the short period between the two albums, nothing on The Question is rushed or sloppy. So yeah... Emery, good stuff. Fin. Catch them on tour with the great As Cities Burn this fall. And order The Question if you want some ground-breaking, intelligent landmark songs in the modern rock syndicate.